A report prepared in 2012 for the Joint Chiefs of Staff entitled Neurobiological & Cognitive Science Insights on Radicalization and Mobilization to Violence: A Review is a valuable reference for anyone wanting to understand the current social and political condition. The paper offers insight and overview into what motivates human being to violence from a neurobiological perspective. Pulling on the latest research from experts around the world, it explains the mechanics of human group think and how populations or individuals can be manipulated away and possibly towards political violence. No bad intention was advocated in the document and it was clearly an attempt at solutions for intervention. Considering the history of psychological operations deployed by governments and media corporations it would be foolish not to look at the other side of the coin. This is an attempt to show how these techniques are being used to promote political violence. The Strategic Multilayer Assessment (SMA) team in partnership with the Nation Institute of Health, DARPA, think tanks, industry and academia wanted to know why someone would go to the lengths of blowing themselves up, joining a terrorist group or even becoming politically active. Most of the report is a primer on neurobiology and psychology. Explaining that some populations and individuals are more prone to violence. If you wanted to read through the whole thing then you wouldn’t need RaptormanReports. Some key points will be reviewed for this article. What would possibly make someone become a terrorist, activist or somewhere in between? Is the population and culture totally, passively or strongly sympathetic to the cause? 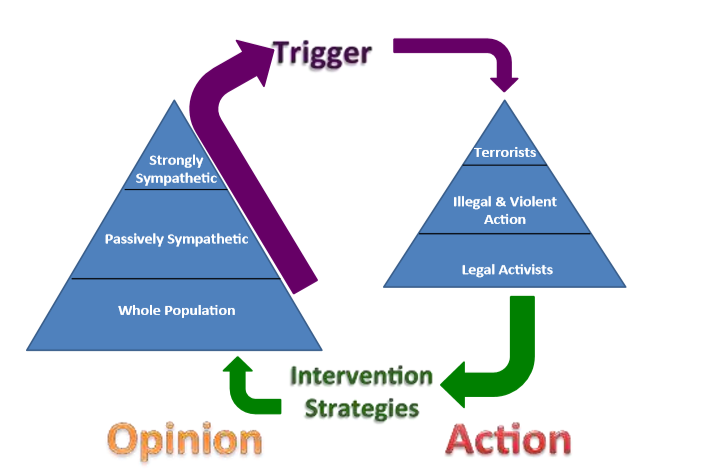 There are strategic points where interventions can be introduced to motivate individuals and groups away from violent extremism. Conversely trigger points can also be induced organically or intentionally to bring about extremism. These trigger points can be socioeconomic, psychological, physical. Even your if candidate has won or lost. How would people be induced into a form of group think? How could they be directed using these innate human instincts ? How would the dynamic look for social control? In-Group advantage: Being part of a clique, party, club or gang that reinforces a specific point of view. Trendy fads and political ideologies melt people together giving them meaning. Conflicts between the In-Group and Out-Group are exacerbated for political advantage. Divide and conquer is as old as the mankind. Display Rules: Political correctness where by everyone appears to adhere to the group think even if those rules are always changing. Social pressure for needed approval leads to self policing, reinforced by social cues of group members. In ISIS you get your head chopped off. At a liberal college you don’t get layed. If your on Twitter or Facebook your censored. Emotional Sensitivity: An collective emotional connection is made, telling everyone when to be happy, sad or scared. If it’s time to freak out just watch leaders in your In-Group from television, the internet or radio giving the social proof needed. Television and the internet has allowed the transmission of trigger events around the world to their target audience. Secondary traumatization through narratives/images raises emotions resulting in violence. Charismatic leaders are adept at making use of highly emotional and vivid portrayals of real or perceived grievances (such as civilian casualties of military operations) to cause secondary traumatization in target populations, galvanizing them to action (Speckhard, 2011, p. 170). Emotions are particularly stoked if the leader is successful in defining those with grievances as fictive kin that need to be defended and avenged. Ideal Effect: Only the point of view espoused by leaders of the In-Group to be consumed by the masses. Everyone else is wrong. Your the special ones that know best. A hierarchy is developed for those who appear to follow rules and those who don’t only leading to more social pressure. This can be done through social cues from any media to the target audience that adheres to the ideal. With any enemy, real or imagined, there must be hate. Carefully nurtured by the collective leadership to dehumanize anyone who opposes the ideal. Violence and hostility are the direct result of the planned inculcation and careful, methodical nurturing of hatred in terrorist groups (Matsumoto, Hwang, & Frank, 2010, pp. 5-6). Hatred is often propagated via stories or narratives. This is done is three phases. Human beings still do not kill or always commit violence even when they hate each other. Our collective evolution prevents this. A political solution or deal is always preferable to violence. Two tomcats will bluster and meow but rarely fight unless vital resources are at stake. We are much the same way. That’s why governments around the world need armies of neuroscientists, that think this stuff up, to keep us fighting with each other. Still hatred is not enough. You must revile your enemy to point of disgust and destroy any hope of trust between the In-Group and Out-group. Give into your anger young SkyWalker! You must have disgust for your enemy to eliminate them. That disgust must be carefully nurtured to the point of looking on an opponent as a contaminated object in need of eradication. Simply label any opposing ideal as racist, bigoted, or inhumane. Bypassing the rational mind and appealing the base emotions, neuro connections are made in the mind of the target audience or In-Group. These are the narratives being propagated by mainstream media at every turn. No longer do people have civil conversations, realizing they both care about the issues. Balkanized into watching CNN, MSNBC, or Fox. Globalist corporations who’s only chance is to feed off your anger! If you disagree you are the enemy to be vanquished. Only to play into the hands of forces that don’t have either of your best intentions in mind. The entire piece is fantastic. Love the paragraph that begins “You must have disgust for your enemy to eliminate them…” and then further “No longer do people have civil conversations, realizing they both care about the issues” – the crux of it all, it seems. No civil conversations anymore, no discussions – it’s off to the Gulag if one doesn’t subscribe to the latest insanity. Great Stuff! Glad you read it carefully. The source document outlines all current and former psychological warfare techniques with links to the academic research. Someone could easily write a book on it.